Senior U.S. EPA chemicals official Nancy Beck has been cleared by agency ethics officials to take part in certain cases involving her former employer, the American Chemistry Council. Kevin Minoli, EPA's designated ethics official, issued Beck a new memo, obtained by E&E News under the Freedom of Information Act, allowing her to participate in five cases where the chemicals trade group had intervened in court. Minoli concluded the U.S. government's interest in Beck participating in the litigation outweighed "any concerns about your impartiality" and authorized Beck to take part in the cases. He noted that Beck, who serves as deputy assistant administrator in EPA's chemicals office, also has helped to defend agency actions and regulations that have been challenged in court. But when the agency was made aware that ACC had intervened in the lawsuits, "you ceased your involvement and sought further ethics advice." "We indicated that unless you received an impartiality determination from me, the federal impartiality standards would prohibit you from continuing your work on specific party matters," said the memo, dated Jan. 11. Minoli's determination will be short-lived. Beck will no longer need it after April 21, when she will not have a "covered relationship" with ACC, according to the memo. Beck has attracted scrutiny as an EPA official due to her past work at ACC, where she often pushed back on agency rules. Last April, she was hired at EPA in an "administratively determined" position and was not considered a political appointee. Consequently, Beck didn't have to sign President Trump's ethics pledge, although she was still bound by federal conflict-of-interest laws (Greenwire, Aug. 8, 2017). At least three Trump appointees at EPA — all former lobbyists — have been given waivers for the president's ethics pledge (Greenwire, Feb. 23). But at least one of those officials didn't end up needing his waiver. Dennis Lee Forsgren, the political deputy in EPA's water office, did not wind up talking about Hurricane Irma with a former lobbying client, the Miccosukee Tribe of Indians of Florida, which triggered the waiver, according to ethics records. The waiver "was ultimately not necessary because the hurricane veered away from the Miccosukee Reservation. Consequently, the Tribe was not as severely impacted as initially anticipated and did not reach out to Mr. Forsgren at all. Therefore, this limited waiver was never utilized." Forsgren still has recused himself from matters involving his former employer, HBW Resources, and its clients. His recusal statement expires June 18, 2019. Other EPA ethics documents obtained by E&E News under FOIA highlight Trump appointees' ties to industry and other interests that have battled with the agency in the past. 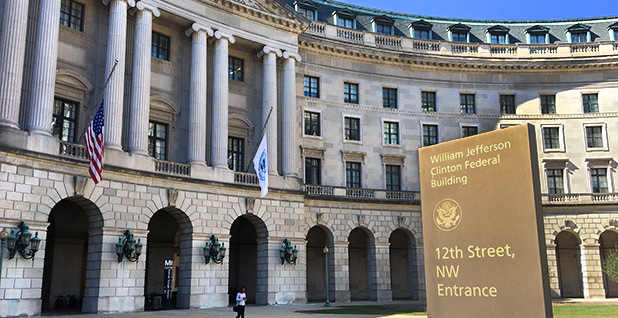 Justin Schwab, deputy general counsel at EPA, wrote two different recusal statements — one in February 2017 as a "beachhead team" member and another this past August after he had joined the agency permanently. Schwab pledged to not take part in matters involving law firm Baker and Hostetler LLP, which is where he used to work before coming to EPA. That includes several former clients that may have "environmental interests" he listed in his statement, such as the American Fuel & Petrochemical Manufacturers, Caterpillar Inc., Chevron Corp., Southern Co. and Valero Renewable Fuels Co. LLC. Schwab also said he wouldn't participate in legal issues where the state of Oklahoma or the Virginia House of Delegates is a party. But both those recusal periods have already ended — Sept. 23 last year for Oklahoma and Aug. 31 for Virginia. Patrick Traylor, deputy assistant administrator for enforcement and compliance assurance, also signed an ethics document, which listed more than four dozen prior energy clients. Traylor, who came to EPA from the law firm Hogan Lovells LLP, spent about two decades at the firm. Traylor agreed not to be involved in particular matters involving utilities like NRG Energy Inc. and Southern California Edison, Koch Companies Public Sector LLC, Koch Minerals, and BHP Billiton Petroleum Inc. The need for his recusal ends June 5, 2019. Like EPA air chief Bill Wehrum, for whom he now works, Senior Counsel David Harlow was previously at the law firm Hunton & Williams LLP. There, his clients included the Utility Air Regulatory Group, DTE Energy Co., Chevron and the holding company for Kentucky Utilities Co., according to his recusal statement from late December. Under Trump's executive order, Harlow wrote that he is barred from participation for two years "in any particular matter" involving clients for whom he or Hunton & Williams provided legal services in the last two years. According to the memo, Harlow is recused from working on five cases challenging various Obama-era regulations, such as the Mercury and Air Toxics Standards and the Clean Power Plan. Administrator Scott Pruitt also has his own recusal statement dated from last May where he pledged to stay out of litigation he pursued against EPA as Oklahoma attorney general (E&E News PM, May 5, 2017). Other Trump appointees were allowed to keep outside jobs. Patrick Davis, a longtime Republican political consultant who was Trump's 2016 Colorado state campaign director, received approval from EPA to be compensated as sales director of Telephone Town Hall Meeting, or TTHM, a teleconference service company. Davis, who is now a senior adviser in EPA's Denver office, had to work for TTHM on his own time and couldn't use agency resources for the job. In addition, he couldn't take part in EPA duties that could affect the company, and his outside income was capped at $27,765 for the year. A number of EPA regional administrators appointed by Trump have also signed recusal statements. Region 4 chief Trey Glenn recused himself from participating in "any particular matter" involving his former employers, Blue Ridge Consulting Services Inc. and Strada Professional Services LLC. He also said he wouldn't take part in matters involving at least 14 clients, including law firm Balch & Bingham LLP, Black Mesa Energy, the Business Council of Alabama and Drummond Co.
Glenn's recusal lasts for two years from the time he joined the federal government. Doug Benevento, who runs EPA's Denver office, filed a similar statement recusing himself from issues that impacted his former employer, Xcel Energy Inc., a utility holding company. Region 7 Administrator Jim Gulliford also pledged to keep his distance from the Soil and Water Conservation Society as well as Agriculture and Conservation Services LLC — both of whom he used to work for. Like Beck of the chemicals office, Pete Lopez, head of EPA's Region 2 branch, was given an impartiality determination to take part in "particular matters" that affect the state of New York. Lopez is a former New York state assemblyman. But it appears other high-profile Trump appointees at EPA were not given ethics documents. Michael Dourson, once an adviser to Pruitt whose nomination to lead the chemicals office was withdrawn last year among Democratic and Republican opposition, came under scrutiny for his ties to industry. EPA didn't find any such records for Dourson, according to the agency's response to E&E News' request. Reporters Hannah Northey and Sean Reilly contributed.